Sainsbury's Bolognese Pasta Bake is from their Be good to Yourself range. Each 400g bake contains a rich ragu of minced beef & tomato with penne pasta and a white sauce, topped with cheese and breadcrumb. Nutritionally, this meal meets all the guidelines for healthy levels of fat, saturated fat and sugar. Salt is bordering on medium with 0.03g per 100g. (See nutritional guidelines). One 400g pack is sufficient for two servings when dishing it up with some fresh vegetables. This would give you 153 calories (minus vegetables). But if you’re eating the whole pack, it’s still only 306 calories and is worth 1 of the recommended 5-a-day. 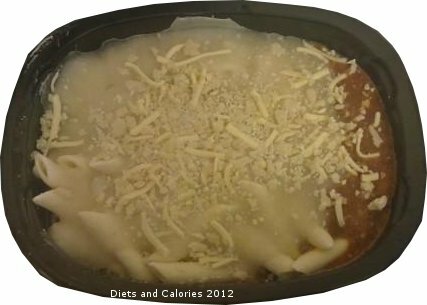 This is a ready meal which can be cooked from frozen either in the microwave or the oven. If you cook it in the oven you do need to keep an eye on the bits of pasta around the edges. If they’re not covered with the Bolognese, they can become burnt. You just need to wait until the sauce has defrosted in the oven then push the pasta underneath. Tastwise, considering the lack of fat, this ready meal does a good job. The sauce is deliciously rich and full of flavour, while the crunchy cheese topping with a smooth layer of white sauce underneath is light and very tasty. 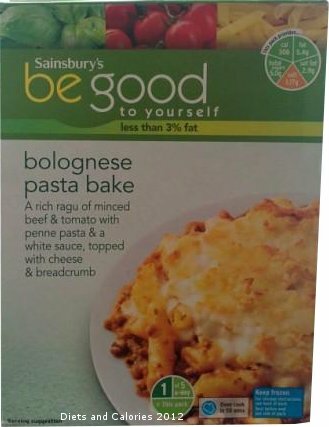 You can find Bolognese Pasta Bake in the freezer section of Sainsbury’s supermarkets. Nutrition Information per pack (400g): 306 calories, 14.4g protein, 50.0g carbohydrates, 5.0g sugar, 5.4g fat, 2.9g saturates, 4.3g fibre, 1.19g salt. 8 Weight Watchers ProPoints as calculated by Sainsbury’s.